Caulk is a magical word isn't it? If you are a DIYer I think you know what I mean. Caulk fills in all those little gaps and makes everything beautiful!! I have found, however, that certain areas need different caulk. I am trying to solve the moisture problem around the window. I learned from my boys bathroom that silicone caulk is much better for this application. ....but have you every used silicone caulk? After some research on the Internet I found a super easy way to use silicone caulk!! Any brand will work, I chose GE Supreme with a 10 year mold free protection. You can buy this in a regular caulk gun tube, but silicone caulk has an expiration date. I didn't want left overs drying out or going bad. I used Sprayway Glass Cleaner which can be purchased lots of places, I got mine at Walmart. You start by squeezing a bead of caulk along your joint. Do a small section at a time. Then you spray over the caulk with the foaming glass cleaner. Sounds weird I know, just stick with me. Then run your finger along the joint, like you normally would,to smooth out the caulk. Normally this is where the night mare begins, as this stuff sticks to everything, but you will be surprised as the excess just wipes off your finger with a paper towel. And there's no mess on your project either!! I caulked where the tile meets the ceiling, the corners, and inside the window cill. 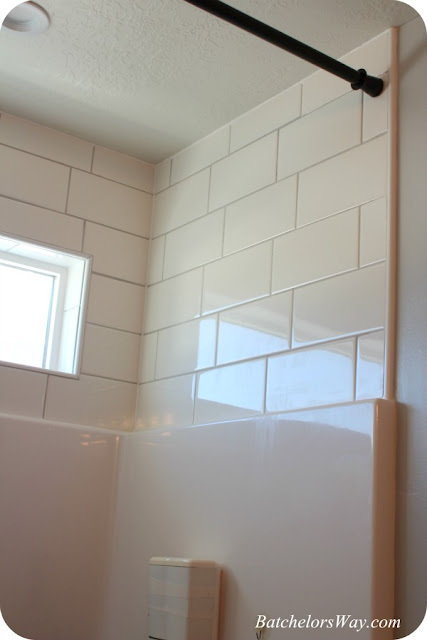 I used latex paintable caulk along the front where the tiles meet the wall; I wanted to be able to paint this part and silicone caulk doesn't take paint. I found two or three videos and articles about this process, but the one I liked the best is below. I was super excited by this, I am such a DIY weirdy! !